After Open House, I do a quick tally of which students brought in their supplies. I usually have a checklist made up so I can just check off each student’s name when they bring in their supplies. Many students and parents do not come to Open House and some that do choose not to bring their supplies so many students arrive that first day with everything loaded down in their backpacks. The first year I taught I had no idea what to do!It was chaos! The last couple of years I have had students take everything out of their backpack, lay it on their table, and then I send students around to collect the supplies in baskets. One student may have a basket and pick up all the crayons, one student will have a basket for pencils, etc. This has worked out pretty well for me. I try to make note of which students are turning in supplies, but if I get busy and don’t pay close attention, I don’t mind. The way I see it is if a student does not bring school supplies to school during the first week then their family probably can’t afford it. My school has a huge population of students who receive free and reduced lunch. I don’t keep sending notes home asking for supplies. If they bring their supplies – wonderful! If they don’t, there must be a reason why. I like using community supplies because that way no one really knows who brought supplies and who didn’t. There’s also none of that “She’s got my crayon” stuff going on. (Who in their right mind wants to label each individual crayon with their child’s name?!) Enough students bring supplies that our classroom is well stocked. I usually buy extras of everything when crayons and pencils and glue sticks are so cheap at the beginning of the school year. Throughout the year if I run out of something, I send a note home on the newsletter asking for donations and one or two parents at least will send things in. 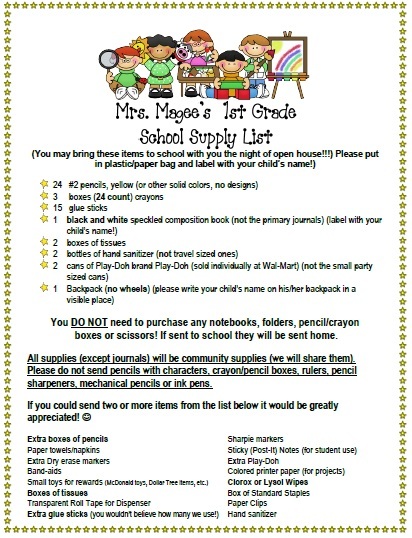 Join the “Managing First Day Supplies” Linky Party over at Mrs. Kincaid’s First Grade! One lucky winner will receive a $10 Target gift card! Thanks for sharing! What you said about families not sending in supplies really spoke to me. You’re right – if they don’t, there must be a reason. That helps me come to terms with not being about to micromanage this ordeal. I appreciate your help! I also use baskets to sort out supplies on the first day. Some of my students order the school supply packs from PTA, but most bring their own. We have a meet and greet night before school starts, then we do our open house a little later. I probably get about half of my supplies before the first day. My cooperating teacher in student teaching had parents label every pencil….. seriously???? I want to do community supplies but my supply list went out before I got my job… so I think all the supplied will be labeled. I might do community supplies anyway. I know what you mean about some students not being able to bring everything. This cuts down on embarrassment for sure!